Today in a meeting held at the Bahrain International Circuit, Formula 1 presented the teams and the FIA its proposals for the future of the sport from 2021 onwards. It must remain road relevant, hybrid and allow manufacturers to build unique and original PU. New PU rules must be attractive for new entrants and Customer teams must have access to equivalent performance. Implement a cost cap that maintains Formula 1's position as the pinnacle of motorsport with a state-of-the-art technology. The new revenue distribution criteria must be more balanced, based on meritocracy of the current performance and reward success for the teams and the Commercial Rights Holder. F1s unique, historical franchise and value must and will still be recognised. Revenue support to both cars and engine suppliers. We must make cars more raceable to increase overtaking opportunities. The cars must and will remain different from each other and maintain performance differentiators like aerodynamics, suspensions and PU performance. However, we believe areas not relevant to fans need to be standardised. A simple and streamline structure between the teams, the FIA and Formula 1. Gasly in the Honda-powered STR and K-Mag in the Haas! Last edited by nanxun; 04-07-2018 at 11:34 AM. That's a dramatic turnaround from the first race. Scuderia Toro Rossi was significantly faster this time. Meanwhile, McLaren gets even more exposed. Not only are they not the fastest Renault team as they claimed they would be, but they are the slowest. I think the end is near for Eric Boullier and Zak Brown. I realize that no real-world performance or test data for the new cars is available as of yet, but does anyone wanna play the game of predicting the teams' pecking order for 2018? Re-visiting my earliest team predictions, prior to winter testing. Clearly, I grossly underestimated Haas and STR and overestimated Force India as well as Williams. Last edited by nanxun; 04-08-2018 at 05:52 AM. Haha after today's race, do you think you might wanna revise that pecking order? Huge congrats to STR, Honda, and Pierre Gasly. Not bad for a GP2 engine in a junior team with a rookie behind the wheel. Hartley could probably have been in the points had he not get that 10s penalty. Having said that, he has been a bit disappointing with his performance. He locks up his wheels quite often and makes far too many mistakes. Still early in the season but seems like he's the weak link in the team and gotta improve in the coming races. Re: McLaren - I agree. They just don't look very good. This keeps up and it's time to clean house at McLaren; these aren't the results this team deserves. Honda has a long way to go, but I'm guessing Red Bull will be powered by Honda in the near future pending more results like this. Kimi's a d-bag. He didn't even go over to the pit crew member that was lying on the ground to offer any semblance of concern. As for the race, it was a good one. Red Bull better get its stuff together. Too talented of a team to be where they are right now. If Ricciardo doesn't start getting on the podium soon I predict he'll leave RB after this season IF there is a spot for him on Mercedes or Ferrari. However, with the way that Bottas is driving Merc would be crazy to trade him for Daniel. While I don't like Kimi, he's a good driver too so I don't know, unless Daniel is eyeing another team that shows potential, like Haas. I think you are being way too harsh on Raikkon. The mechanic must have been in incredible pain, but there was already professional medical staff tending him by the time Raikkonen walked back to the Ferrari pits. The last thing the medics probably wanted was for non essential personnel to enter the accident scene. We're not talking about someone being hit by a bean ball to the stomach. I was more surprised that Ferrari allowed Vettel to have a celebration on the podium. With Vettel, I doubt that he knew how severe the accident was since he just got out of the car. But if I was Arrivebenne, I would have had someone tell Vettel not to spray the rose water. You think so? I was thinking Bottas is under quite a bit of pressure as he doesn't seem to be quite good enough for Mercedes. He was quite a bit behind Hamilton in points last season. This season, in Australia, his Q3 mistake meant that he couldn't help Hamilton from fighting with Vettel and Raikkonen properly. For today's race, I was a little surprised that he didn't try to close the gap between him and Vettel earlier, and left it just a bit too late to do anything to take advantage of Vettel's situation. I think the race was pretty exciting one. Seeing Haas and Toro Rosso finishing that high up is awesome. Although, Grojean needs to be getting better out of his car. Hopefully it was just a bad weekend. Will really be funny if Honda finally figures things out this year and ends up beating McLaren If Haas and Toro Rosso can keep things up and Red Bull don't get their issues sorted out it could make for an interesting battle for third possibly. The Kimi issue was scary and I think they need to go back to the lolli pop stick man vs this electronic system as there just seems to be too many pit stop issues so far this year. I don't blame Kimi for not going over after the issue. In fact I think he made the right decision on letting the medical responders handle it and not get in the way. 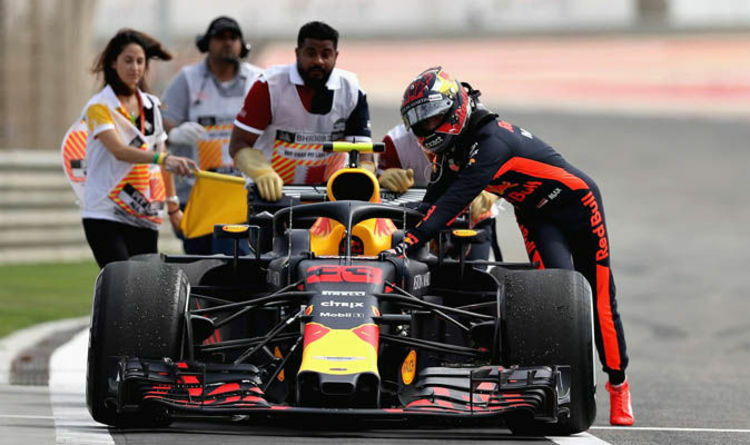 An experienced Formula 1 driver ran over a mechanic and broke his leg during the Bahrain Grand Prix on Sunday. The incident occured when Kimi Räikkönen made a routine pit-stop after 35 of 57 laps. The Ferrari driver stopped for a tyre change, waited for the green light, and then sped off to rejoin the race. However, Räikkönen was given the green light before the left rear tyre had even been changed — and Ferrari mechanic Francesco Cigorini was still tending to the wheel. In the image below, you can see the position Cigorini's leg was in (circled) when Räikkönen drove off. Räikkönen ran over Cigorini, who immediately collapsed to the floor in pain. Cigorini suffered a fracture of the tibia and fibula in his left leg and was taken to hospital for treatment. "What happened to our guy Francesco today at the pit-stop is very unfortunate," Räikkönen, who retired after the incident, said in an official statement on Ferrari's F1 website. "I feel sorry for him and hope he's going to be okay soon. It's always a bad thing when someone gets injured but I am sure he has the best people taking good care of him and I wish him a speedy recovery. "As for the accident itself, all I know is that I moved when I saw the green light go on. I couldn't have possibly realised that there was an issue with the rear left wheel, then I saw someone had got hurt, and immediately, I was told to spot by the team. Unfortunately something must have gone wrong and we'll need to find out what." Ferrari has been fined €50,000 ($61,500) by race officials for an unsafe release, according to the BBC. Toro Rosso beating their sister team which had both cars fail is very big news. I think Toro Rosso have just about sorted everything out. They just need to keep out of trouble which most other teams were getting into. The Bahrain track is engine breaker track, having HONDA come out in 4th is very good news for HONDA/ACURA fans. That Ferrari mechanic put himself in danger. He put himself in front of that tire. I agree. Bahrain track is a higher speed track then most others. It's a very good test of the engines. It seems like the Honda PU is quite reliable on actual race tracks. The concern thus far is on street circuits, where the roads are more bumpy and the curbing is probably higher. Gasly's car broke down in Melbourne when he went a bit ride and the car bottom out and hit the curbing relatively hard, twice. That's exactly the moment the PU crapped out (I believe it was the MGU-H). In barcelona testing and in Bahrain with nice and smooth track surface, the car's been pretty good! It shows that the engine is pretty decent in both cold and hot weather. Having said that, it's just one race where TR performed very well considering its budget and driver line up....just like how Melbourne was a one off, Bahrain could also just be that. Still 18 races to go so hopefully things will stay the same like in Bahrain! I'm just concerned about durability though. The PU can be reliable for one whole race weekend, but i wonder how many race weekends it can last. With only 3 units available, this could be an issue. ESPN will run all of the remaining qualifying and race telecasts of the 2018 Formula 1 season commercial-free after listening to fans after their Australian Grand Prix coverage. ESPN joined forces with Sky Sports to deliver broadcast coverage of this year’s campaign. That deal includes every practice session, qualifying and all 21 races of the year. ESPN also broadcasts Sky Sports’ build-up show ‘On The Grid’, which it will do for every race this year. Having listened to viewer feedback of the Australian Grand Prix coverage the decision was made to run commercial-free during qualifying and the race at the following event in Bahrain. This was met positively by race fans across America and it will be extended for the duration of the current campaign. ESPN will continue to look at ways to improve its F1 coverage throughout the year. “We intend to present the F1 races in this way for the balance of the 2018 season,” said Burke Magnus, ESPN executive vice president, programming & scheduling. “F1 fans are passionate and we listened to a lot of feedback from them — the fans are very informed and the feedback we received was both polite and constructive. It helped us. Thank goodness they decided to do this. It was so nice to watch the race with no commercials and see everything in full screen with commentary. More entertaining race than Australia, hats off to ToroRosso/Honda/Gasly for 4th place, their post race celebration of the team members was full of joy. For his 7th race Gasly performed extremely well, staying out of trouble at the start, sticking to finishing, great choice to replace Kvyat. Toro Rosso/Red Bull has done very good to select drivers in the past decade (Vettel, Riccardio,Verstappen). I expect Red Bull to get the Honda engine for 2019. Was also very impressed on how well Vettel resisted pressure from Bottas in the last 5 laps. The one team that has really disappointed is Williams, they have a MB power unit and are in last place after two races. Force India is doing much better with their MB PU but woulda thought in Paddy Lowe's second season that Williams could produce a better chassis. Wonder how much is the driver's inexperience and how much is the chassis? James Allison, Technical Director at MB has been their spokesman with YouTube videos that are pretty candid. That's awesome. Loved the non-interrupted coverage. Will be re-signing up for YouTubeTV this week, was really disappointed with PSVue. Definitely a shame about Williams, pretty sad performance. I understand your point but don't totally agree. For me, regardless of the circumstances we're human first. Let the medics say, "we got it Kimi" but at least make an attempt at being concerned for a fellow team member. He didn't even look his way. Bottas had a great first year with Mercedes. He finished 3rd overall, only 22 point behind Vettel. The next closest was Raikkonen who was 100 points behind Bottas. I imagine if he didn't have to play second fiddle to Hamilton he would have had more points. Bottas is also doing pretty good this year. We're only two races in and he already has a second place podium. I don't think he had a chance catching the Ferrari in Bahrain. This was the best broadcast I've seen in years. Entertaining race, no commercials, and announcers that knew what they were talking about. It seems like the Honda engine isn't too far off from Renault's now. If we were to talking about driver's inexperience, wouldn't TR's drivers be the least experienced in F1? Lance Stroll at least had a year in F1 already. Haha by the way what I said was coming from my friend who's a Mercedes and Hamilton fan. Given the superiority of the Mercedes car last year, I just feel Bottas should be above Vettel. Hamilton had no reliabilily issue (and no DNF), Bottas had an engine failure and so 1 DNF. Ferrari on the other hand had quite a few reliability issues, especially in the second half of the season - the most notable one was Vettel's engine failure at Suzuka. He also had engine issues meaning he had to do recovery drives a few times, namely from P18 to P4 in Montreal, and P20 to P4 in Malaysia. He also had some bad luck, like the tire puncture right at the end of the Silverstone GP along with Raikkonen. And man, that crash right at the start of Singapore IMO was the point where he totally lost the title race. But yes haha, I agree, Bottas was probably hired by MB to play second fiddle to Hamilton as he was pissed that he didn't win the title in 2016. I think MB said the thought they'd have 90% chance with beating Vettel. I was wondering why Bottas didn't try to catch up to Vettel earlier. Bottas later explained that he had to nurse his tires as well as the tires tend to overheat easily. He can only push for a few laps and have to let the tires cool down before going again. And perhaps the soft tires on Vettel's car lasted longer than expected, so he was actually able to pull further away when his tires were still okay. I agree with Palmer, that Bottas although a very good driver lacks that essential killer instinct that Vettel, Hamilton,Verstappen, Ricairrdo, Alonso, Kimi have. If you go back and watch it he does look that way while walking to the car. It is brief but he does make a glance in that direction. That is what makes me think he decided it was better off to not get in the way. Last edited by CCColtsicehockey; 04-12-2018 at 08:52 AM. as orchestrated as everything is in F1 I'm certain Kimi was told to go straight to the back of the pits via radio before exiting the car. For sure. I'm a Hamilton fan but Bottas was a relative nobody before he joined the team. I was talking to my wife while watching the first race of the year about this in fact. I pulled out my program books I get from the F1 races at COTA each year (I knew those $20 purchases would come in handy some day). In them they always have pages with bios and stats on each driver. I looked up Bottas' stats from the years leading up to his joining Mercedes and here they are. These numbers are cumulative btw. And points? 645. That's 58% more points added to all of the years he's been in F1 - in ONE YEAR. And it wasn't even the end of the season yet. Hell, they could have picked me. That's how good the Hybrid Merc is. It might have not been reflected in the stats, but Bottas had a very promising reputation based on his drive with Williams. I think this was largely based on him matching up with Massa, but Massa was never a world beater. Yet, some were speculating that Bottas would be able to challenge Hamilton. In F1, you can never really tell until the first race. Last edited by F-C; 04-12-2018 at 08:26 PM. He's still a tier 2 driver, occasionally shines and can out qualify Hamilton occasionally. But he's no Hamilton, as much rumored attitude Hamilton has internally at MB (supposedly MB F1 employee's prefered Rosberg who was more down to earth and far less conceited) he's still a helluva driver who when he's mind's forward thinking he delivers. Still wonder how Alonso and Vettel would have done at MB? A sensor problem – that’s what a Ferrari investigation has found was the reason for Kimi Raikkonen being instructed to leave his pit box too early in last weekend’s Bahrain Grand Prix, resulting in one of his mechanics suffering a broken leg. There was an issue removing the left-rear tyre when Raikkonen boxed for the second time in Sakhir, meaning pit crew member Francesco Cigarini was unable to fit the new tyre. However, a green light was given to signal the pit stop was complete and Raikkonen duly pulled away, knocking Cigarini to the ground. He was taken to hospital for surgery, having suffered a double leg fracture. Ferrari were handed a €50,000 fine for the unsafe release, which came hot on the heels of Haas's double unsafe release in Australia, with Ferrari Team Principal Maurizio Arrivabene saying the team made it a priority to uncover what had happened. “The team was hurt,” said Arrivabene. “We have a person who was injured, so it was in our interest to review the overall procedure. “We have a procedure to ensure that the pit stops during the race are done in the most safe mode. In this case we have three factors – one involves human control, the other involves mechanical, the other involves [an] electronic device [sensor]. “What’s happening there is we have a mishandling of the rear left. It was not perfectly read by the electronic device that gives the green light. It appears Ferrari’s system thought the tyre had been changed, as the wheelgun had been engaged and then disengaged. Measures have since put in place in a bid to avoid a repeat scenario. Arrivabene said Cigarini was “fine” and went back home to Italy on Thursday. He added: “I would like to thank our team doctor, the medical staff of the FIA and also the authorities in Bahrain. Unsafe releases remained a big talking point in China on Friday, with McLaren the latest team to suffer an issue with Stoffel Vandoorne stopping in FP2 with a suspected loose wheel. Sure hope that mechanic is really okay and will be able to eventually rejoin the team. Last edited by nanxun; 04-14-2018 at 03:54 AM. Ballsy strategy move by Red Bull. Amazing change of fortune for Ricairrdo. Is Gasley taking after Max now? Both moves were poor judgement at best, gotta give some credit to Horner he admitted it was a bad move by Max. Last edited by Legend2TL; 04-15-2018 at 09:25 AM. Nice drive for Danny Ricc. Very happy for his crew, who had to rebuild the PU. Impressed by the Hulk's consistency. Last edited by nanxun; 04-15-2018 at 10:07 AM.